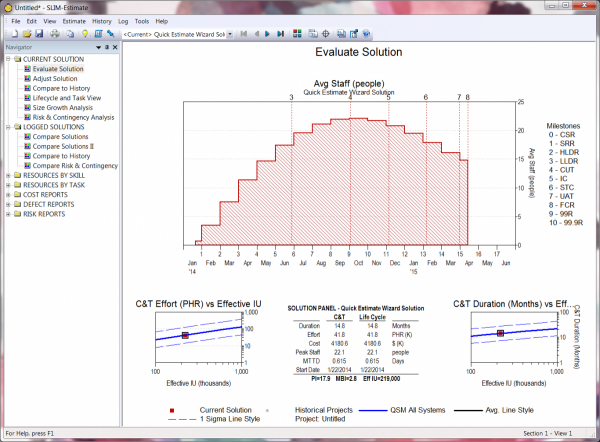 QSM has recently released an update to the feature-rich SLIM-Suite of tools. For a detailed list of updates, download the SLIM-Suite 10.1 release notes. The 10.1 desktop release updates the look and feel of SLIM-Suite tools with easier-to-read fonts and a cleaner, simpler color palette inspired by modern Business Intelligence and Data Analysis applications. A new, high resolution theme also offers better support for high DPI and high resolution monitors. Many of the visual updates are subtle, so this post will cover the high impact features you're likely to notice on upgrading to SLIM-Suite 10.1. In SLIM-Estimate, cross-hatched phase shading on time series charts has been replaced by lighter, transparent curve fills that grow progressively darker for successive phases. 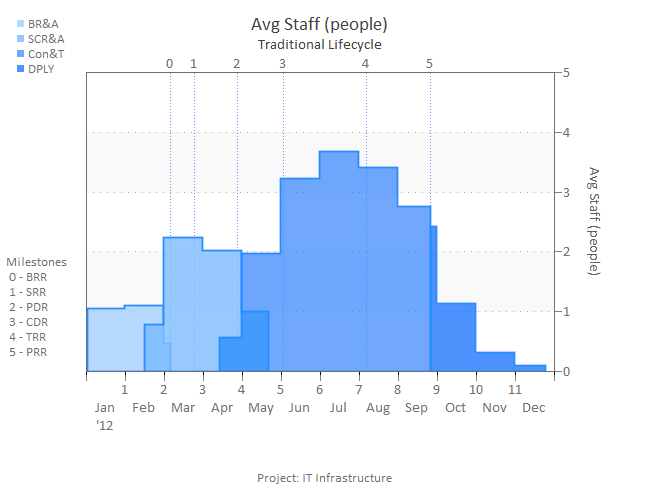 The view below shows staffing over time, not broken out by role, for a project using a traditional lifecycle. QSM recently launched a new online user forum program specifically for our clients. Hosted monthly, these user forums allow current users of our SLIM-Suite to ask questions and share tips on how they are currently using the tools. The theme of our most recent forum was "More than One Way to Skin an Estimate," which reviewed SLIM-Estimate solution methods and different ways to approach estimating challenges that users might have in their particular project environment. Moderated by Lead Support Representative and Trainer Laura Zuber, Laura started the meeting by revisiting the software production equation, which shows the relationship between size, effort, time, and productivity. By rearranging the equation different ways, the user can solve for what they don't know. This is the basis of our new redesigned solution wizards: Balanced Risk, ROM Estimate, Fixed Resources, Bid Evaluation/Playback, Time-Boxed, and Re-Estimate an In-Flight Project. After Laura gave a live demonstration of these wizards, we received great feedback from users that they found them more intuitive and helpful resources to get the answers they need. After the demo, clients were able to ask questions and share helpful tips and tricks that they have discovered in the tools. One user particularly liked analyzing scope creep using the Size Growth Analysis feature, while another recommended using the trend mix feature when estimating a complex project. Laura also took feedback and product feature requests. This is the kind of close feedback we want from our customers to get them the best value possible from our tools. This user forum was a great success and we look forward to hosting these sessions regularly in the future. If you are SLIM-Suite user and would like to participate, please contact us. QSM is pleased to announce a major update to the QSM Database, the largest continuously-updated software project performance metrics database in the world. With this update, we have validated and added more than 2,500 projects to the database in 9 major application domains (Avionics, IT, Command & Control, Microcode, Process Control, Real Time, Scientific, System Software, and Telecom) and 45 sub-domains, resulting in a current total of more than 13,000 completed projects. QSM is pleased to announce the release of SLIM-Suite 10.0, the latest version of our flagship software estimation, tracking, and benchmarking suite of tools. With new quadrant chart visualization features, the updated version of the SLIM-Suite allows users to gain visibility into multiple projects at once and, as a result, easily identify high-risk projects, improve demand management, and address project feasibility issues early in the process. Additionally, users can now map staff capacity to portfolio demand to ensure that development resources are utilized across projects and available when needed. Updated 2017 industry trends: Estimates now leverage the latest project data from 2017 to provide better metrics for more accurate portfolio planning. New skills aggregation capabilities: This new feature expands upon the existing functionality to include detailed breakouts of effort, staffing, and cost by skill by month for subsystem tasks beyond Excel to include custom and SLIM-Control tasks in addition to SLIM-Estimate tasks. Better database management features: SLIM-Suite 10.0 allows easier detection of duplicate projects and improved data importing capabilities. Why Should I Care about the Actual Data? The Project Is Complete. 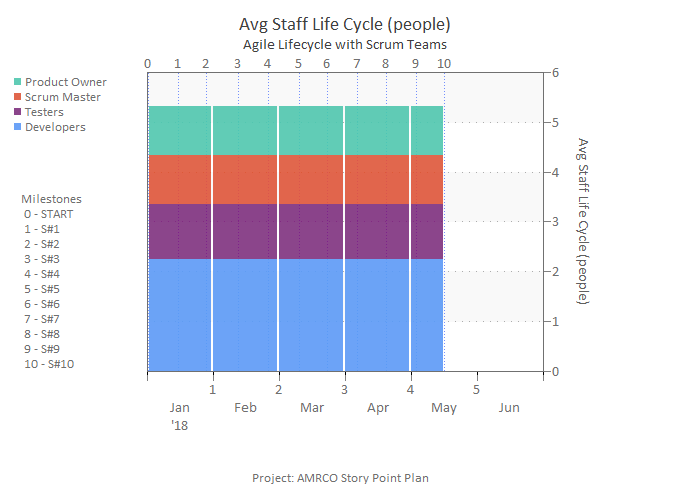 Why would a project team or program management office (PMO) take the time and spend the resources to collect information about a project that was just completed? Isn’t this the time when victory is declared and everyone runs for the hills? In many cases, delving into what happened and what actual costs and durations were incurred can seem like an exercise in self-flagellation. Read more about Why Should I Care about the Actual Data? The Project Is Complete. A foundation of the SLIM philosophy is to know what your team is capable of producing and never promise to deliver more than those finite limits. Leveraging a history of completed project core metrics enables you to quantify your capabilities, and not only provide a defensible basis of estimation, but support statistical analysis for project benchmarking and identifying performance improvement opportunities. QSM's newest release of SLIM-Suite, version 9.0, provides a number of enhancements to simplify and organize completed project data in SLIM-DataManager and manage data set definitions and queries in SLIM-Metrics. In this webinar, Laura Zuber demonstrates key new features of both products. You will see how providing project size details, master keyword lists, multiple view layouts, and multi-select variable analysis equip you to expand your historical project repository and increase its use. On July 14, 2015 at 1:00 PM EDT, QSM's Laura Zuber presented What's New in SLIM-Suite 9.0. QSM's newest release of SLIM-Suite, version 9.0, provides a number of enhancements to simplify and organize completed project data in SLIM-DataManager and manage data sets definitions and queries in SLIM-Metrics. In this webinar, Laura Zuber will demonstrate key new features of both products. You will see how providing project size details, master keyword lists, multiple view layouts, and multi-select variable analysis equip you to expand your historical project repository and increase its use. Laura Zuber has 20 years of experience in software development consulting and training. She has conducted training and demonstrations for all QSM SLIM Suite Tools and assisted with QSM Support. Laura has managed software development projects, served as a senior software process improvement specialist, performed process assessments, designed and implemented best practices, and co-lead corporate metrics training program. 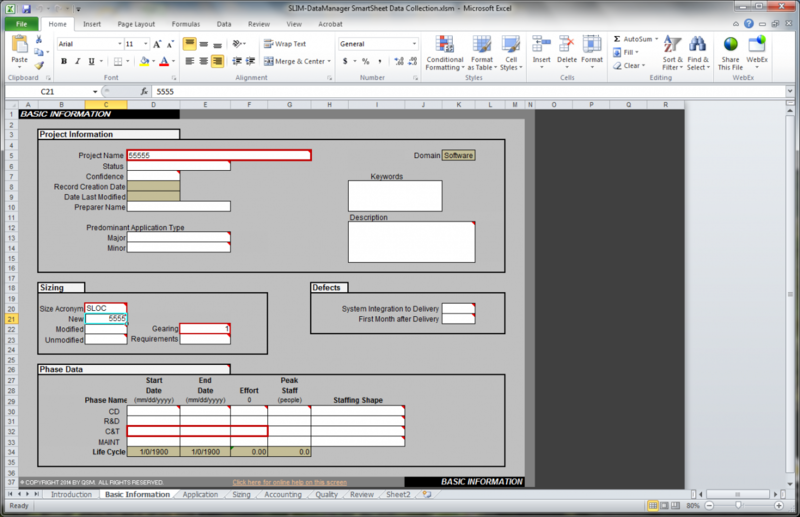 Launch the Windows Snipping Tool to capture screen settings or data and email them to your team. Once you get the hang of it, creating your own custom menu items is easy: if you can unzip files and use Notepad, trust me – you can do this! Launch the Windows Snipping tool. The menu items I created fell into several categories: launching an external application, launching a SLIM-Suite utility/API, pointing to an external process guide, launching a Windows utility. I’ll cover each one, providing sample configuration text for each. I rather enjoyed the Google Analytics April Fools prank earlier this month, Welcome to Data-Less Decision Making on Analytics Academy. Though satirical, this video brings to light an important reason why individuals have such trouble making decisions in a business environment: they don’t have data. I’ll agree that without data it’s really appealing to turn to the coin flip method and be done with it. After all, 50/50 odds really aren’t terrible, right? But project management software such as SLIM-Estimate make empirically-based business decisions possible, even when company data isn’t immediately available. Leveraging our database that contains over 10,000 projects, QSM has developed and regularly updates 17 distinct industry trends. When creating an estimate or benchmarking a past performance, simply select the QSM industry trend that most closely reflects the type of system being built. This will serve as a reference point. If historical data is available but you’re unsure of which metrics to collect, SLIM-SmartSheets is a new downloadable feature in SLIM version 8.2 that mimics the look and feel of SLIM-DataManager and allows users to collect project data, even when they’re not on a network computer. Each project can then be pulled into one SLIM-DataManager file using the API. The new look and feel of the default workbooks in SLIM Suite are based around infographic and dashboard design principles. Information Dashboard Design by Stephen Few served as an excellent resource for updating the views and color schemes in SLIM Suite 8.2. Our goal in updating the look and feel of SLIM-Suite 8.2 was to highlight the pertinent inputs and outputs in bright, bold colors and to allow other view elements like gridlines or historic data to fade into the background by using more muted colors, allowing you to focus on the important metrics when making key management decisions. As you step through the default workbook in SLIM-Estimate, you'll notice that the default folders and view names have changed. Views have been reorganized into folders with descriptive, functional names to make it easier to find the right views, charts, and reports and give users a more effective dashboard for evaluating solutions, adjusting them and reviewing logged solutions. SLIM Suite 8.2 comes with four themes to choose from, plus two placeholders for your own custom themes.